In 2004 the music industry will launch over 300 debut female recording artists worldwide. With such competition it is unlikely that many, if any, will successfully build a career. Only the strongest talent will survive and shine out against these odds. 22-year-old Natasha Bedingfield is that talent. She has, quite simply, what it takes. A voice to melt radios. A decade long passion for writing and singing. An image that is defiantly, vigorously her own. And, of course, one of the biggest UK singles of this year so far to her name (chart #3; radio airplay #1, highest played video on MTV). Hailing from London via New Zealand, Natasha Bedingfield is natural, fresh and honest. She is intelligent, emphatic, and confident. And as her chart-topping debut ‘Single’ suggested she is unattached and independent. It is this flair and personality that shines brightly throughout Natasha Bedingfield’s recordings: “What do I want people to get from my music?’ she ponders ‘Identify with it, be inspired by it, dance to it”. For the past year, Natasha has worked in L.A. and London based studios alongside the world’s finest writers, producers and musicians to deliver a body of work that meets these criteria, and more. 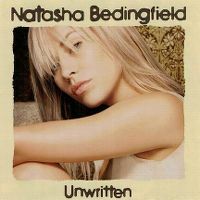 Natasha Bedingfield’s debut album ‘Unwritten’ draws on a range of experiences and passions personal to her – from battling through the dating game (‘Frogs And Princes’), and dealing with the trust issues of falling in love (‘I Bruise Easily’) to learning how to carpe diem (‘If You’re Gonna Jump’) and develop the confidence to take life and own it (‘Unwritten’). Told from the viewpoint of a young woman with her head firmly screwed on, ‘Unwritten’ is fuelled by lyrical sass and real-life suss throughout. Musically the album is inspired by a wide range of influences and styles, from the glam rock of ‘Silent Movie’ through the muscular funk of ‘Single’ to the orchestral majesty of ‘Wild Horses’. The result? An album packed with winning songs and no irrelevant fillers. An album that speaks the universal language of pop more fluently than most. An album that proves its artist to be refreshingly of-the-moment at the same time as being in it for the long-haul. ein super album, sehr abwechslungsreich. von balladen ueber popnummern bis zu rapeinlagen (d12) hat es alles drauf. und sie hat einfach eine super stimme! Overall a good album. Uptempo pop songs and ballads generally very nice, but some really weak trips to territories like rock and rap. THESE WORDS!!!!!!!!!!!!! ABARTIG GUT!!!!!! SUPER!!! Eines der besten Alben ever. Und es ist schwer als Album eine 6 zu bekommen doch Natasha hat es geschafft. Alleine schon die Texte sind super. Diese Frau kann super Singen und das Album hat einige sehr starke Lieder! Die erste CD von Natasha Bedingfield hat schöne Songs drauf. Die kleine Schwester von UK Pop-Star Daniel Bedingfield zeigt, dass sie auch erfolgreich im Musikbusiness sein kann. Nur weiter so, Natasha! Tolle CD ... die Songs sind super schön. Fast schon ein lupenreiner Pop ... "These Words" und "Unwritten" sind und bleiben meine Lieblinge auf dem Album! Kommen wir zuerst zu den Schwachpunkten auf "Unwritten". Die einschläfernde, fade Balladensuppe "White horses" u. die 2 überproduzierten Popknallerbsen "I`m a bomb" & "If you`re gonna". Ansonsten hat das Album nur gutes ("Single", "Silent movie", "Drop me in the middle") bis wahrhaftig sehr gutes ("These words", "Unwritten", "I bruise easily" & "We`re all mad") anzubieten. 4+ gute Singles, ein paar Füller und ein großartiger Closer..dazu eine Wahnsinnsstimme. Wunderbares Album von Natasha - damals noch "die Schwester von Daniel".